LONDON--(BUSINESS WIRE)--The latest market research report by Technavio on the global field service management (FSM) market predicts a CAGR of around 12% during the period 2017-2021. 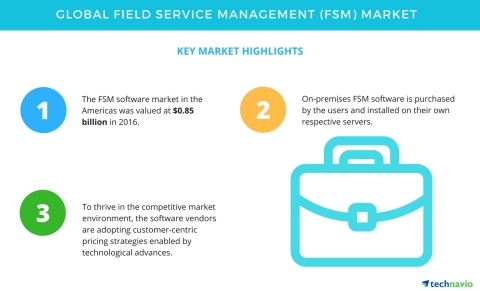 The report segments the global FSM market by deployment (on-premises FSM software and cloud-based FSM software) and by geography (the Americas, EMEA, and APAC). It provides a detailed illustration of the major factors influencing the market, including drivers, opportunities, trends, and industry-specific challenges. Increasing demand for SaaS-based FSM solutions is one of the major factors driving the global field service management market. With the rise of cloud computing in the global FSM software market, several enterprises are opting to deploy their software solutions off-site. For such enterprises, shifting to a cloud-based SaaS model reduces the burden on IT departments and lets external service providers offer support and maintenance to their users. Enterprises of all sizes are deploying SaaS-based solutions as they are economical, can be accessed from anywhere, and provide all functionalities at the lowest total cost of ownership (TCO). According to Amrita Choudhury, a lead analyst at Technavio for enterprise application research, “The growing acceptance of SaaS-based FSM software can be attributed to its high deployment speed, low upfront costs, and flexibility to scale up and down based on the requirements of the user. SaaS-based FSM software further enables organizations to access data and services remotely through a web browser without installing and managing application software”. Technavio researchers anticipate high growth for the global field service management market in the Americas due to the availability of adequate IT infrastructure and the high penetration of large and small enterprises in the US and Canada. Organizations across several industry verticals in the Americas are improving their business processes to enhance customer satisfaction and to gain competitive advantages in the global market. The adoption of FSM software is the highest in the North American countries, such as the US and Canada, because of the growth of service organizations and the presence of in-home healthcare providers, utility solution providers, and HVAC repair businesses. The global FSM software market is facing intense competition because of the presence of many vendors. The key vendors are constantly competing for a leading position in the market. The competition in this market is likely to intensify further in the coming years with the rise in mergers and acquisitions and technological advances. Vendors with better financial resources and technical skills can develop products with advanced features such as role-based access, native mobile apps for Android, iOS, and Windows devices, customer self-service portals, and scheduling and dispatch. Access Technavio’s continuously growing enterprise application research library and find expert analysis on hundreds of markets. The latest market research report by Technavio on the global field service management (FSM) market predicts a CAGR of around 12% from 2017-2021.